creative savv: What do you like to make with cabbage? What do you like to make with cabbage? Many of us bought a head or two of cabbage this past week. Now, the challenge is to find interesting ways to use it up. Cole slaw is always a good stand-by. I also like to add it to stir fries and fried rice. But two of my favorite ways to use cabbage are for a particular soup and in a salad. The soup is one I used to order in a diner near us over 20 years ago. This restaurant called it Cabbage Patch Soup. I've done my best to replicate it over the years. However, I've never settled on a set recipe. Basically, it's a tomato-based soup, with onions, garlic, carrots, celery, canned tomatoes, ground beef, or crumbled, cooked Italian sausage, or TVP granules, or as in our case the other day, lentils, plus lots of shredded cabbage. If I have some homemade pasta sauce, I'll add that, as well as added oregano and salt, as desired. 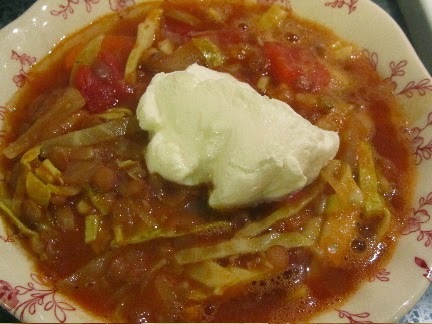 The key to Cabbage Patch Soup is to add the shredded, raw cabbage just 5 minutes before serving. Here's an approximate recipe, in case you want to give it a try. 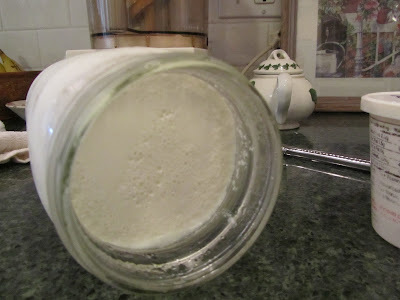 In a large pot, heat 1 tablespoon vegetable oil. Saute onions (1/2 a large onion, chopped), any meat (4 oz to 8 oz), and garlic (1 or 2 cloves, minced), until meat is cooked/onions are translucent. Drain excess fat, as desired. Add about 3 cups of veggie stock/liquid from 14 oz. can of diced tomatoes (set drained tomatoes aside). Add sliced carrots, celery, dry lentils (if using), and bring to a boil. Reduce heat and simmer 30 to 40 minutes (until lentils/veggies are tender). About 5-8 minutes before serving, add TVP granules (if using), and 2 large handfuls of shredded green cabbage. Bring up to simmer, and cook for 5 minutes. I especially love Cabbage Patch Soup when topped with grated Parmesan. But it's also delicious with a dollop of sour cream, or plain and simple, as is. 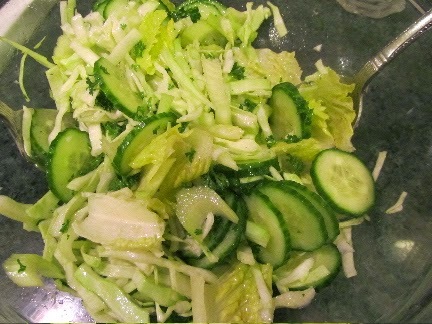 My other favorite way to use up the cabbage is added to other raw, green veggies and tossed with a vinaigrette dressing. The other night I had some lettuce, cucumber, and celery that needed using up. I tossed in some shredded cabbage and leftover homemade raspberry vinaigrette. Used in a salad this way, the flavor of cabbage is downplayed considerably. But it still adds a nice crunch. So tell me, what are your favorite ways to use cabbage? I bought 4 heads this past week. Perhaps you can guess, I'm very eager to hear how you like to use cabbage. Pan fry it in a tablespoon or two of bacon grease! Not that healthy, but oh so delicious! Yum! Happy Wednesday to ya!! Oh, yum! I'm putting that on my menu for this weekend, as Saturday morning we're having bacon with breakfast! I make a slaw by marinating shredded cabbage in Italian Salad dressing, After several hours I add chopped apple, sunflower seeds and a bit of Mayo. I never enjoyed cole slaw before I had this version. That sounds delicious! I'll have to add that to my list of salads to try! Soups, roasted wedges, slaw, as a cooked side with root veggies added, or for a nice twist -- it makes a great base for a stir fry. I don't *love* cabbage but both my mom and my husband make a cole slaw with chopped apple (I don't think it's the same as frugalspinster's)--I think part of the reason I like it is the sauce has lots of sugar in it! I do like it in soups. 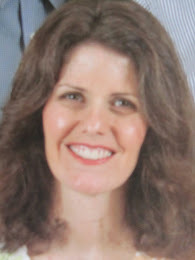 I'm with Kris, Shara, tell us how you roast it! I am assuming you toss wedges with oil, salt and pepper. How long do you roast it for, and how do you know it's done -- is it caramelized like other roast veggies? And about how big are the wedges? This does sound very appealing! what else does your husband and mom add to an apple/cabbage slaw? I think they start with mayo or miracle whip, add a little vinegar, oil, and sugar, but as I'm the happy recipient, I've never really asked--I just eat and enjoy. :) It's sort of a sweet/tangy flavor. I don't care for traditional cole slaw dressing. This is similar to KFC cole slaw. Sometimes a little carrot is thrown in, and in my mom's case, probably a little diced onion as well. I think cabbage is in egg rolls and I love those, but have never tried making them. Thanks, Kris. I have an idea of how your mom's and husband's cole slaw must taste. And, yes, when I've made egg rolls (back in the days when I deep-fried a lot), I did use cabbage in them. Hmm, maybe a batch of egg rolls are on the horizon. Steam half a sliced cabbage for 3 minutes. Grease a pie dish and put to warm in a medium oven. In a bowl, mix together some bacon, 2 eggs, finely sliced onion, garlic, parsley and salt and pepper. Add 200g flour and 250 ml milk. Spread half the batter / dough in the pie dish, pack in the cabbage and put rest of batter / dough over top of that. Bake for about 35 minutes til golden and firm. Cheese is nice on top. So, for anyone else interested in trying this recipe, I looked up the conversions, and 200 g of flour, should be about 1 3/4 cups of all-purpose flour, and 250 ml milk should be about 1 cup of milk. Thanks for the recipe, Jess! I'm a big cabbage fan in just about any way you can use it. I actually love it simple - just sauteed with onion and maybe carrot in some butter - served with fresh ground pepper. I also used to have a borscht recipe that used cabbage, beets and onion. I haven't made it in a while - not sure why because it was delicious! I've never made borscht before. I may just have to try this! Thanks for the suggestion. Okay now, I've never heard of golumbki. I'll have to google that. So, I just searched. It sounds like golumbki are stuffed cabbage rolls, or thereabouts. I've been thinking about making some stuffed cabbage rolls with rice, lentils, onions and garlic. What do you think? Would they hold together w/o any meat to bind them? yes, I make meat free cabbage rolls all the time and it works fine - I've added an egg before to the mix and that helps. Think I know what's on the menu for Friday dinner! Yes, these can be more vegetarian, if desired. Lentils would be delicious! Thanks, Carol! I'm thinking of cooked lentils, brown rice, garlic, onion, and adding a bit of bread crumbs to bind it all together, then topping with some homemade marinara and mozzarella cheese, for tonight's dinner. Lots of good ideas and a few I haven't tried. However, perhaps the way I like it best is raw. Raw is good. I've read that raw cabbage is a good source of Vitamin C.
I like various types of coleslaw. I have a Peas 'N Peanuts slaw with a mild curry dressing that is very tasty. Cabbage Noodle Salad made with crushed raw ramen noodles is very tasty too. It has toasted almonds and sesame seeds, green onions, and a tangy dressing that includes the seasoning packet from the instant noodles. Both of those salads sound delicious! I currently have a good supply of peanuts (also have about a cup of frozen peas in the freezer), so the Peas and Peanut slaw is very doable for us. I also bought a couple heads of cabbage this week. We like to make cabbage rolls - and fill them with a similar mixture as stuffed peppers. We also love fish tacos and use cabbage instead of lettuce. It holds up better to the fried fish. I know what you mean by the cabbage holding up better in the tacos. I like a finely cut cole slaw on sandwiches, for that same reason. The cole slaw remains firm and crunchy. Fish tacos, now there's something my family would love for me to make!